There is no way to deny the fact that SUVs look great, especially in the city. However, what counts the most is how they act in all driving situations and choosing between the top of the line models is definitely difficult. We are now referring to the 4th generation Rover, a model that went way up from the seventies original. Mercedes-Benz is very well known for the luxury sedans offered but the GL350 BlueTec is an off-roader that is morphing traditional capability with modern technology. Both vehicles are perfect for the road so we will mainly talk about the features that are important for off-road situations, which is the reason why you may want to buy such strong SUVs. With a price tag of around $180,000, the Range Rover Vogue TDV6 has many extra features you will love like the Meridian sound system. Various interesting storage options are offered, including the highly talked about split tailgate. We can say that the only thing you will not like from the design is that it is pretty hard to get inside the SUV as the car is high and there are no side steps. However, once you get inside you will be surrounded by functionality and comfort. When driving on-road, you will love the luxury offered and the suspension is supple. When you look at Range Rover Vogue TDV6’s engine, you will love it since it is 400 kilograms lighter than the last model (this SUV is one of the lightest available in its class). We are looking at a 3.0 litre V6 with 600Nm and 100kW, equipped with an 8 speed automatic gearbox. It is great for anything from sand to roads. As you switch to the off-road setting, suspension is raised by 7.5 cm, which automatically raises clearance to 29.5 cm. We have a suitable active centre that manages to improve traction while eliminating bind-up in tight, slow corners. The price is around $130,000 and for that price you get a lot of gear included from the 360 degrees camera to leather, wood and many assistance systems like drowsiness detection and blind-spot warnings. Even the side steps are illuminated. If you plan to do a lot of off-road driving, you will need to pay an extra $3,500 for an extra pack that includes more underbody protection, low-range gears, locking centre differential and 3 off-road settings. The main feature you will appreciate in GL350 while off the road is the suspension, which adds 8 cm to clearance, going up to 29.6 cm. When the suspension is raised, the vehicle will have a firmer ride. You do not have much wheel travel available so the wheels and electronics will work harder. While on the road, more ripples are transmitted into your cabin but the feeling you get is relatively agile and you will appreciate this at higher speeds. The engine that you get is quiet, similar to the one of the Range Rover. We are talking about a V6 turbo diesel 3.0 litre with 620Nm and 190kw. No matter what manufacturers want you to think or what you may believe at the moment, there is no perfect SUV for off-roading. The Range Rover Vogue TDV6 is more expensive and it should be perfect but it is not. However, it is quite close. This SUV is highly luxurious when faced with a challenging road. The only real problems are the smaller fuel tank and the shock absorber feature, which is not as good as it should be. 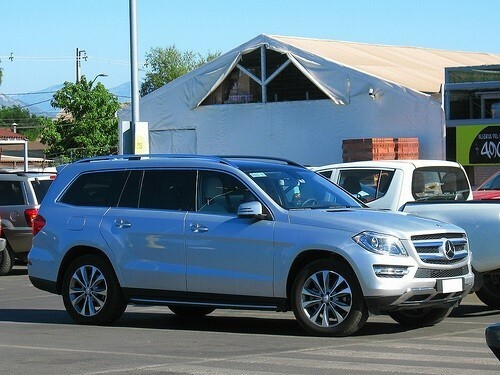 The Mercedes-Benz GL350 BlueTec is athletic and frugal when dealing with corners but on the whole, it is not so adept when faced with off-road situations. The tires are most likely the biggest let down. However, the lower price tag is the one that will be the most attractive. If you mainly drive in on-road conditions, this may be the SUV for you.